The design of songket varies from the basic 4-petal pucuk rebung to the scenic floral design and abstract design. Long and spread to the knee, these are the generous proportions of a masterpiece. Fewer and simpler designs are less expensive yet retains the high workmanship quality as obvious on the complicated ones. Delicate designs, for examples, abstract or floral scene, may take up to 4 months for our weavers to complete a single piece. 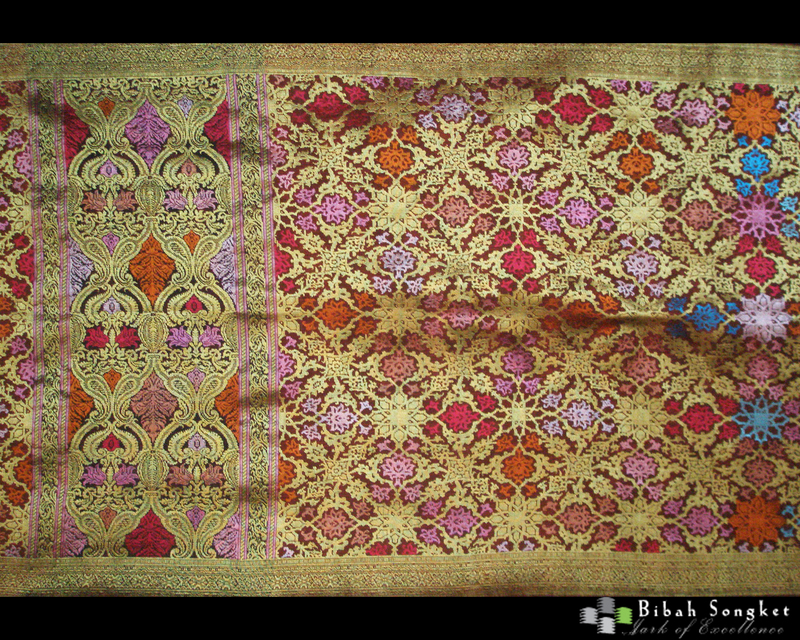 Repeated design is commonplace on traditional songket, thus the choices of colours are of importance in this instance. Observe the songket that features a variety of colours. Notice the intricacy of the weft and thread composed. In the art of songket, any piece with multi-coloured gold threads patterns are much harder to make than the single or double coloured gold threads. A weavers needs to constantly change the coloured thread every row at each desired spots to faithfully produce the design pattern onto the fabric, which at most, can only produce less than 3 inches of work per day. Such laborious effort is itself a sign of quality and time commitment. The use of ikat technique produces a woven textile juxtaposed with different shades of colours. The ikat technique is an additional process that requires the tie-and-dye of the base loom. The shades created via this technique are made to blend with the bright colours of the patterns thus toning down the audacity of the songket design. Much expertise is required to choose the right colour combinations. Colours of the background play an important role, sometimes more important that the design itself. Before one can pay attention to design details, the overall colour is the predominant criteria. Perfect colour combination indulges the eyes of the beholder, creating a sense of harmony and contrast rarely demonstrated on plain pieces. Songket is hand woven. A skillful weaver must be able to produce a masterpiece to the extend of near perfection. When one observe the master's craftsmanship, it should achieve machine-made textile qualities - high degree of precision, error-free execution and accurate finishing. These are what made a weaver an expert in her craft.